When building a college list, it’s critical to check graduation rates. Paying for college is hard enough without adding a fifth or six year to the tab! And yet most college students do not graduate in four years. Many, many parents whom I’ve talked to over the years seem shocked by this reality. In fact, when I give talks to parents in California, I almost always hear a visible gasp from the audience when I reach the slide in my PowerPoint presentation that shows the shockingly low graduation rates of many California state universities. 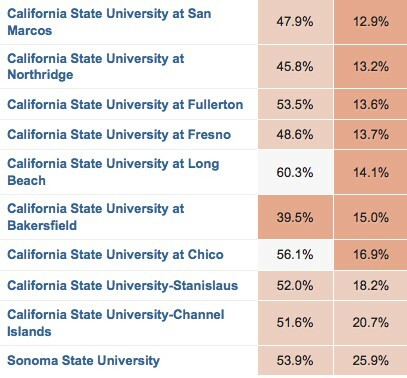 Take a gander below at the public universities in California that have the very worst four-year grad rates. No. 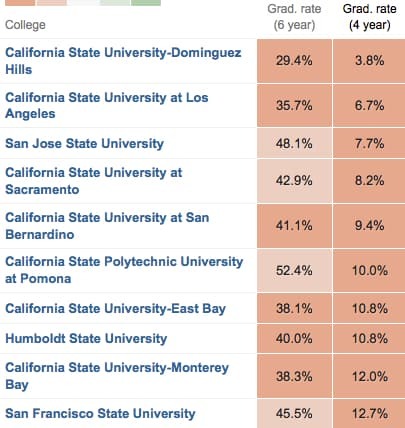 1 on this hall of shame list is California State University, Dominquez Hills where only 3.8% of its students graduate in four years! I hope this depressing chart will serve as a wake-up call for you to investigate grad rates for your relevant schools. Not surprisingly, the most elite schools, which primarily educate wealthy students, enjoy the highest four-year grad rates. The parents of the students attending these schools are much more likely to be able to pay for a bachelor’s degree and watch their children graduate in the traditional eight semesters. 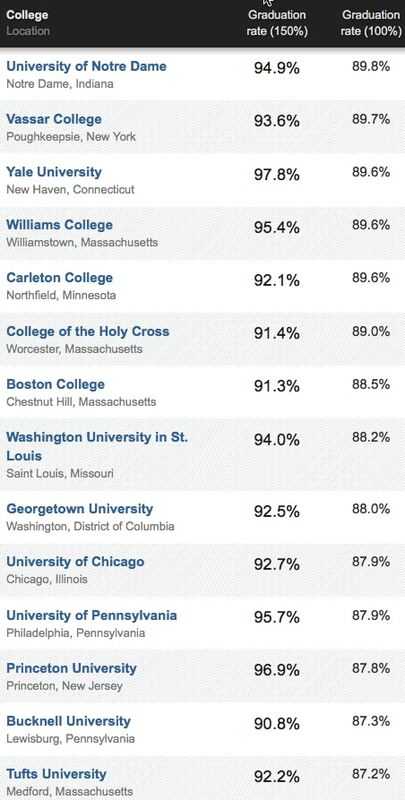 Below are the schools with the nation’s highest grad rates. The University of Notre Dame enjoys the highest four-year grad rate of any school in the country. In contrast to the experience of wealthy students, plenty of other students have to drop out of school, at least temporarily, or transfer to a cheaper institution because they can’t afford to continue. These students can be less likely than their wealthy peers to handle the rigors of college. Another huge problem for students at less selective schools, like many of the Cal State campuses, is that students can’t get the classes that they need to graduate on time. Schools with low grad rates would like you to believe that it’s all their students fault for failing to graduate, but this is largely a cop-out! Universities with students from similar demographics can have wildly different graduation outcomes. Among otherwise similar institutions, according to the Education Trust, a highly respected think tank, graduation rates can vary by as many as 20 percentage points. What’s the explanation for this? Successful universities make it an institutional priority to increase the chances that all their students, regardless of their socio-economic background, graduate on time! I want to emphasize that all these four-year grad rates are based exclusively on students who start out as freshmen as full-time students. Students who begin college part-time do not impact the rates of any schools. You can not only find significant graduation differences among schools that attract the same kind of student body, but that also sport the same price tag. Here is an example using two expensive liberal arts colleges that are both located in Amherst, MA. 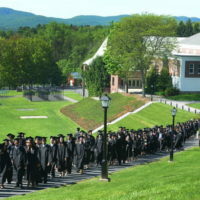 Hampshire College has a four-year grad rate of just 55.6%. 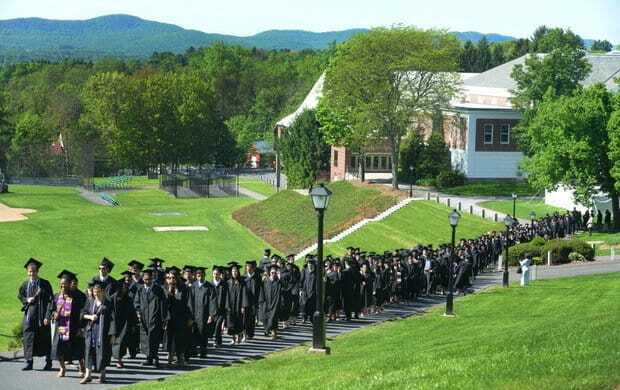 Amherst College, which attracts a freshmen class with higher academic stats, has a four-year grad rate of 89.5%. Both of these schools cost more than $65,000! One reason why Hampshire’s four-year grad rate is so low for an expensive liberal arts college is because only 82% of its freshmen return. In contrast, 98% of Amherst’s students return after their first year. Among four-year institutions, 36.5% of students who start at a public college or university end up transferring elsewhere and 34.3% of students at private nonprofit schools transfer too. Wow! College Completion: Microsite of The Chronicle of Higher Education. College Results Online: Creation of The Education Trust. This resource also provides freshmen retention rate percentages. A lackluster grad rate shouldn’t be an automatic deal breaker. If a grad rate is troubling, research what it takes to graduate in four years. Being in an honors college at a state university, for instance, could make the path to a four-year degree smoother. In contrast, students pursuing engineering, nursing or some other majors might find it difficult to graduate in the traditional four years at some institutions. The best way to cut the cost of college is to become an educated consumer. You can learn how by attending my popular online course, The College Cost Lab. On June 6, I’ll be launching The College Cost Lab, but if you sign up now you’ll get access to the class beginning on Memorial Day weekend! I hope you register today! Thanks so much for an excellent article! One of the best I’ve read in a long time. I help CA transfers get to the UCs, and community colleges have always had this burden. Shocking to see it so prevalent. Yes, the graduation rate is MUCH higher at public honors college. The average 6 year graduation rate at a public honors program is 89%. Let’s talk more about these great programs. My daughters are paying less than $20K per year for room, board, tuition and fees to go to a top ranked public university, in a honors program. Part of the benefit is attending classes with fewer than 20 students. I am curious as to what you take out of the numbers where the 4 year rate may be low for a public school, but the 6 year rate is fairly high. I just saw a shopping sheet on CSU Long Beach and their 4 year rate may be low but their 6 year rate is now at 65.2%. I would think that one interpretation of that would mean a good curriculum, but because it is a state school they can not offer enough classes to get everyone through. I tell parents that the best financial aid they can get is having the student pass the AP exams to have a better shot at graudating in 4 years. Lynn, The history of graduation rates at state universities has always been closer to 5 or 6 years, as a vast majority of students are working, either on campus or have part time work/full time college, or full time work/part time college. Do you know if there are any statistics that show the graduation rates of students who begin college (regardless of where they start) and successfully complete their degree? From personal experience here in Irvine, CA many students take longer, but most complete within 5 years, as up to 50% attend community college. It’s definitely tied to affordability. What I find disheartening is that there a so many parents who don’t do their homework beforehand, so that they are NOT spending so much money on a private college which simply doesn’t fit for their student in the first place. On a more happier note, my son graduates from UCLA this June – in 4 years! It is for this reason (as well as freshman retention rates) that I talk to students and their families about other very good options that guarantee a student graduates within 4 years. When a student spends more than 4 years as an undergrad, any additional semester is a double loss because they are not only paying more tuition, but also the student is not making money in their career or moving onto grad school. I have two children at San Diego state university. My daughter, a junior liberal studies major, is on track to graduate in 4 years. My son, a freshman pre-engineering major, was informed at orientation that his program requirements would span 5 years and includes summer classes! My point is that there are many factors that influence 4-year graduation rates, including your choice of major. I’m curious if any of your resources break the data down in a meaningful way for analysis of these various factors Also your point about the inability to register for needed classes is not a small matter and can really skew a public university’s results. I have been following you for many years since I saw you speak at HTHI and appreciate your thoughtful analyses! I would also add difficulty in getting the classes you need to graduate. My son is graduating in 4 years from UC Santa Cruz next month (knock on wood). He has had to fight for the classes he needs since he was a freshman. Especially difficult to get are the required labs for the Science classes. For example, there were 125 lecture slots available for a Physiology lecture course and only 80 for the associated lab. Thanks Jean. That is a big reason why students can’t graduate in four years and especially at state universities. California schools are notorious for having this problem! I think this somewhat a myth or maybe it depends on the state. My daughter is finishing up as a STEM major at Maryland. She did 4 years of undergrad research, 4 years of volunteer work in a clinical setting, tutored kids in a disadvantaged school district, and graduated within 4 years (next week). She had no problems registering for any of the classes she needed or wanted. This from a college with 27,500 undergrads. Sadly this is not a myth. These are federal statistics that I am showing you. It is true that the grad rates of some state schools are better than other. The flagships typically have the best rates in their states as opposed to the regional state universities. The four-year grad rate at the flagship campus of the U. of Maryland is 66% and for women it’s 73%.